The only problem with a successful safety effort is success. Success can seriously damage the organizational and individual sense of vulnerability necessary for future success. When no accidents happen for a long enough period of time, people can drop their guard. Celebrations of success that don’t include admonishments for renewed effort can lead to workers who are too busy patting themselves on the back to be safe. The age old, “it isn’t going to happen to me” mentality begins to grow and minds start to think their bodies are bulletproof. Some of the best-performing organizations in safety are the ones where workers come to work each day with a full realization that accidents are possible and waiting. No one lowers their guard because they know the dangers are still there. There is a healthy respect for the possibility of a tragedy and everyone is standing guard to prevent it. Vulnerability need not reach the panic level, but also cannot be allowed to go completely away, even for moments. Just like disease, accidents are best addressed through early detection and management of risk factors; not through reactive measures to control the damage. Can your organization celebrate success without losing its healthy sense of vulnerability? The late Stephen Covey said that one of the habits of highly-effective people is to “Seek First to Understand, Then to Be Understood.” Most safety programs do exactly the opposite and are therefore not highly effective. Leaders and safety professionals decide what is needed and deploy new programs and processes without consulting the very people who know the issues in the field, and will ultimately determine the success or failure of new initiatives. Organizations regularly hire consultants to analyze their problems and the consultants get the information to do so directly from the organization’s employees. A good consultant is a good listener first and a good problem solver second. But listening is more than just hearing sounds. It begins with setting the right tone for the conversation. There must be a non-threatening and respectful atmosphere in which the listening can take place. There also needs to be an honest and frank expectation of how the information will potentially be used. Skepticism often arises from past interviews or surveys from which no action has been taken. Enough of this kind of skepticism can render the conversation useless. Sometimes, the right questions need to be asked to spark the right discussions and discover the underlying issues. When issues emerge from the discussions, they need to be probed and understood more fully. That means that the right questions need the right follow-up questions as well. The whole process can build upon itself once those interviewed realize that their input is being valued and can potentially lead to improvements. Listening is ultimately empowering people by taking them seriously. Greetings everyone, this podcast recorded while in Craig, CO. I’d like to share an article I wrote, published September 2013 in BIC Magazine. The published article can either be found on the magazine’s website or under Insights at www.ProActSafety.com. An expert on team-building once suggested that an excellent team member may occasionally break a rule but would NEVER violate a principle. At first, these two concepts seem incongruous. How could someone break a rule without violating a principle as well? The simple answer is that rules are incomplete and imperfect. They are often made with good intentions but seldom completely address all contingencies or always achieve the goal for which they were created. Principles, on the other hand, are more universal. They apply to all or many situations whereas rules are often specific to a particular task or circumstance. Also, a few principles can replace a lot of rules making it easier for workers to internalize them. For example: A rule might be “Never walk underneath a suspended load on a crane” or “Never walk into the path of an oncoming fork truck” or “Always walk through the pedestrian doors and not through the equipment doors.” The principle behind these and many other rules is “Always avoid placing yourself in the path of moving or potentially moving objects.” The more often you are in the path, the more likely you will be struck by a moving object. Teaching workers safety principles prepares them to meet a variety of risks and to creatively apply what they have learned. Rules tend to be “one rule to one risk” and teach workers to be mindlessly compliant. What do they do when they face a task for which the organization has no rule or is an exception to the rule? If they know the principle, they tend to assess the situation and devise a strategy to address it. Rules are guidelines to play a game. Too many rules can make safety seem like an artificial activity governed by arbitrary guidelines. Principles are strategic values that offer knowledge and wisdom to apply to the variety of situations we face in life and work. They guide thinking rather than replacing it. I heard a good analogy recently about the difference between hazards and risks. “Hazards are the sharks you spot in ocean while standing on the shore. They become Risks when you get in the water.” How well do you help those you lead, understand, identify, and respond to the differences? With good intentions, many organizations prompt activities to purposefully and proactively identify potential hazards in the workplace. While this is admirable, it becomes a complex issue when there isn’t a shared understanding of what a hazard is and isn’t, and how some turn into risk. But, not all risk will turn into incidents and injuries. Further, if there is a shared belief that “safe means zero risk and safety first”, or “safety is our number one priority”; might there be mixed signals sent? Consider how this might be interpreted, “They say our goal is zero injuries and zero risks and that ‘safety first’ means we are controlling all the risks, yet we have brought several to management’s attention with no action!” This isn’t just hyperbole, this misunderstanding was the result of a conversation with a key union official within a client organization. Some safety advocates propose there is little point in debating terminology. I strongly disagree. How common language is used influences beliefs and behaviors within the culture. The English language has many different meanings for the same word. Have you ever used a word or phrase that was interpreted incorrectly? Of course you have. You know how important it is to use the correct words when communicating with your family. Why should our dialogue within safety be less important? After all, isn’t it our number one priority? Or wait, is it a core value? 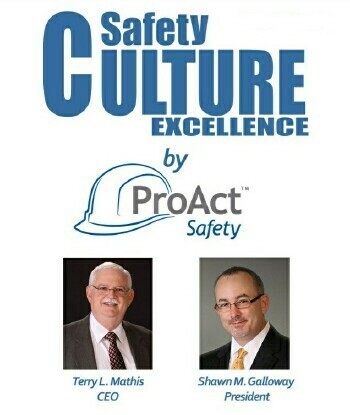 Shawn M. Galloway is the President of ProAct Safety and the coauthor of two books, his latest published Feb 2013 by Wiley is STEPS to Safety Culture Excellence. As an internationally recognized safety excellence expert, he has helped hundreds of organizations within every major industry to achieve and sustain excellence in performance and culture. He has been listed in this year’s National Safety Council Top 40 Rising Stars, EHS Today Magazine’s 50 People Who Most Influenced EHS and ISHN Magazine’s POWER 101 – Leaders of the EHS World and again in the recent, elite list of Up and Coming Thought Leaders. In addition to the books, Shawn has authored over 300 podcasts, 100 articles and 80 videos on the subject of safety excellence in culture and performance. Greetings everyone, this podcast recorded while in Starkville, Mississippi. I’d like to share an article written by Terry Mathis, published June 2013 in EHS Today Magazine. It was titled, The Perceptions That Shape Safety Excellence. The published article can either be found on the magazine’s website or under Insights at www.ProActSafety.com. Greetings everyone, this podcast recorded while in Bethesda, Maryland. I’d like to share an article I wrote, published June 2013 in BIC Magazine. It was titled, Overcoming invulnerability to strengthen safety culture. The published article can either be found on the magazine’s website or under Insights at www.ProActSafety.com. The fact that perceptions affect safety cultures is undeniable, yet the best intending organizations often pay little attention to perceptions and the conditioning affect they have on new employees or the company. Whether accurate or not, perceptions become culturally-norming beliefs. When these common beliefs are combined with unclear values, potentially negative attitudes, and hypercompetitive priorities, a dangerous mixture of influences is placed on individuals attempting to solve problems in day-to-day operations. The need to understand perceptions and what drives them is critical. Many organizations measure perceptions, but few effectively manage them. There are two types of perceptions: accurate and inaccurate. Which ones are you responding to? Perceptions are influenced by multiple sources, both internal and external. Unmanaged perceptions negatively affect safety communication. Even worse, they have been identified as contributing factors in multiple catastrophic incidents. Culture is made up of common practices, attitudes, and perceptions of risks that influence behavioral choices at work and away from work. Culture is also influenced by management, leadership, supervision, workplace conditions, and logistics. Measuring a culture involves a complex metric of perceptions, workplace realities, past accident history, and inter-connectivity of the people. Perceptions are an important consideration when determining methods to improve safety or other aspects of performance. Perceptions affect behaviors, and they should be measured to determine a starting place for cultural modification efforts. Perception surveys can help identify areas for improvement and can serve as a baseline for measuring the effectiveness of improvement efforts. The workshop focuses on how to measure, understand, and manage the perceptions that either facilitate or impede achieving and sustaining safety excellence. Attendees will be provided with extensive examples of perception survey report templates and detailed examples of different reporting styles. Greetings, this podcast recorded while in Soda Springs, Idaho. For the podcast this week I’d like to share an article I wrote that was published in March 2012 in my column in BIC Magazine. It was titled, Perception Surveys: Myths and Managing Results. The published article can either be found at www.BICAllliance.com or under Insights at www.ProActSafety.com.